“Alone in this world.” That’s how Victor Serche, one of my citizens, is described when I click on him. No spouse. No children. Such a grim, blunt way to put things. Such a phrase might also describe my city. Alone in this world, in a crater, surrounded by snow-swept wasteland on all sides. On the first night of my colony’s establishment, 20 people—that’s one-quarter of the population—die from exposure to the elements. Frostpunk, set in an alternate steam-powered world, pulls no punches in making your new settlement struggle and claw its way to survival. An ice age has forced survivors away from London in hopes of a better life, where they discover a massive generator around which to settle their new colony. This coal-eating behemoth is the lifeblood of your people; if it dies, your city isn’t far behind. A major feature of this game is the system of laws, which forces you to make tough choices about trying to keep your population (somewhat) happy or just keep them alive another day. Due to the constant battle against the cold, a fair portion of your workforce will be sick and miss work, which means reduced resource production. Do you pass a law allowing child labor for “safe” jobs to fill empty work slots? When citizens die, do you elect to build a cemetery, which will keep some citizens from work for a few crucial hours whenever there is a burial ceremony but lowers the population’s discontent? Or do you build a snow pit outside the city to inelegantly freeze the bodies, raising discontent but creating the potential to pass a law to use those corpses for organ transplants in the future? You may find it easy to watch your morals slip away if it means your city seeing another sunrise. Aside from resources like food, wood, coal, and steel, two major things to juggle are your citizens’ levels of hope and discontent. Laws often effect both, and if people go hungry for too long, or your promises go unfulfilled and discontent gets too great, the citizens will come after their leader (that’s you). You will then have a limited time to raise their hope, and if you fail, you’ll be exiled to your death in the frozen wastes. Other elements are out of your hand—chiefly the weather. A calendar in the upper corner warns you of upcoming changes in temperature, a blue thermometer taunting you before plunging to −40 degrees Fahrenheit or lower. Certain buildings, such as vegetable-growing centers, don’t function in deep cold, and the chance of frostbite spikes dramatically. It feels like an achievement just to survive a handful of days until the weather warms back up. Giant spider-like automatons can eventually be built at enormous cost, taking some pressure off of your citizens. They really fit the game’s aesthetic; powered by steam cores, they trundle through snowbanks, occasionally latching on to the generator to recharge themselves. I came to like these things more than my citizens: they don’t eat, they don’t get sick or get frostbite, and they work nearly 24 hours a day. 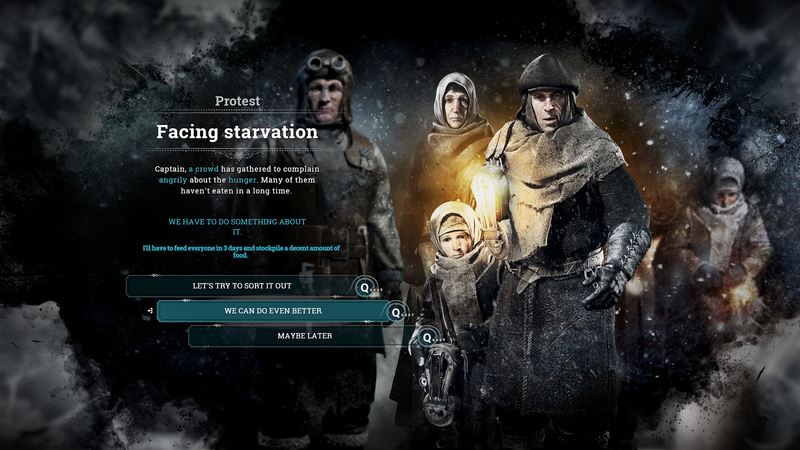 Frostpunk is similar to 11 bit studios’ previous game, This War of Mine, which placed players in the role of civilians during the Siege of Sarajevo, forcing them to make morally gray choices in the name of survival. I’m reminded of these personal stories when I’m forced to make more intimate decisions in this game based on my citizens’ actions. In one situation, after enacting a law for radical medical treatment, I was faced with a situation where a man with severe frostbite did not want want his leg amputated. I had the choice of forcing him to have the leg removed or doing nothing, with a great chance that he would die. I forced him to have the amputation, knowing I would begin producing prostheses soon. Several days later, I was informed the man has taken his own life. There are no easy choices in this world. I often found myself adopting a “bread and circuses” (well, mainly circuses) mentality, trying to keep my populace preoccupied with awful things like fighting pits and legalizing duels. At no point do I feel particularly great while passing laws, especially with things like implementing emergency 12-hour work shifts. Laws in Frostpunk can’t be repealed, and there’s a cooldown period of 18 hours after a law is passed to prevent spamming laws. Unlike today’s politicians, you’re beholden to your promises—if you pass a law legalizing public houses, you have to build a pub within a few days or tempt your citizens’ wrath. If you haven’t gathered by now, this isn’t exactly a cheery game. City planning requires some thought, as the further from the generator, the colder buildings are. 11 bit studios. 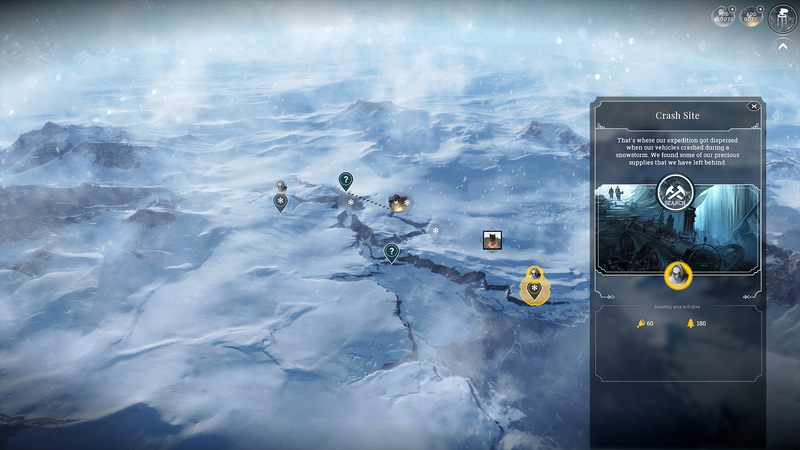 In what seems like an odd choice, Frostpunk only has premade scenarios to play. That said, the three scenarios each have a hefty amount of content to complete, and future scenarios are advertised in the main menu. However, a city-builder game without a free-build mode seems just plain wrong. In a post on Steam, the developers stated a sandbox mode is “on our mind,” so it’s possible we could see it sometime in the future. Additionally, in a tweet, 11 bit has committed to developing an expansion pack for Frostpunk due to high sales. It’s fun to go back in the scenarios and try out new combinations of laws to see how disastrous or successful they are—testing the effects of making your town a den of sin, with prostitution, duels, and public hangings, or maybe trying the polar opposite, passing laws to steel your citizens’ religious faith with churches and prayer. That said, the fun that comes from messing around with different options only goes so far, given the restrictions of the various scenarios. 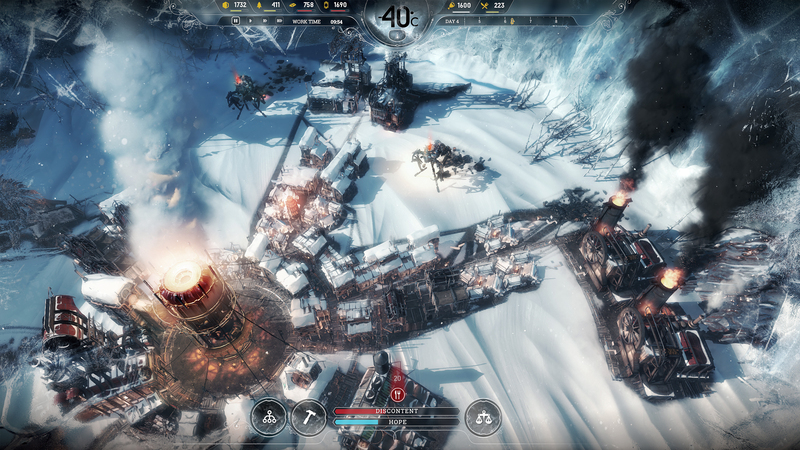 Frostpunk has great style, mixing elements of steampunk with a dash of postapocalypse. The buildings are properly ramshackle, and snowdrifts pile on and around them as the weather shifts, like some hellish version of Minnesota. I only wish I could zoom in further to see the full detail on citizens trudging through snowbanks. The map isn’t very large—nearly all the action takes place in a single crater—and the color palette is predominantly brown and white. The game launched with an asking price of $30, which I feel is reasonable for the amount of content you get, especially if the game is going to grow. 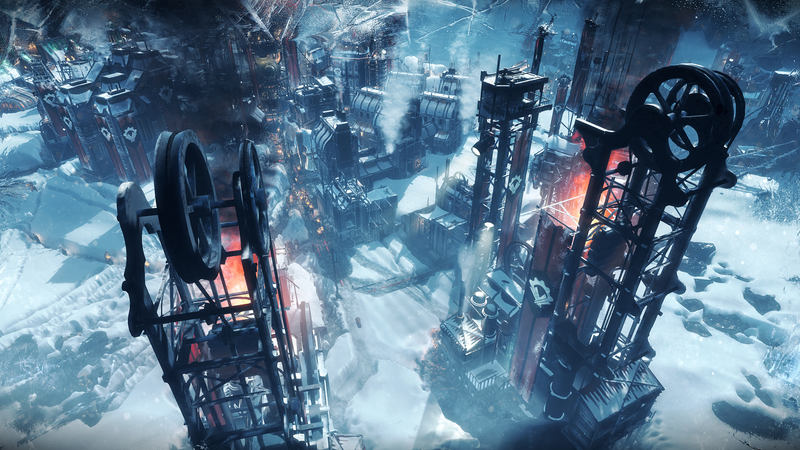 With some more content and a free-build mode, Frostpunk would be a truly great city-building game. If you’re looking for total freedom in city planning, it may not be the game for you. But if you’re looking for a unique setting and want to act out your inner anthropologist or dictator on this human ant farm, you may have come to the right place. No matter how you choose to govern, you are this city’s last, best hope. Frostpunk is available on PC.